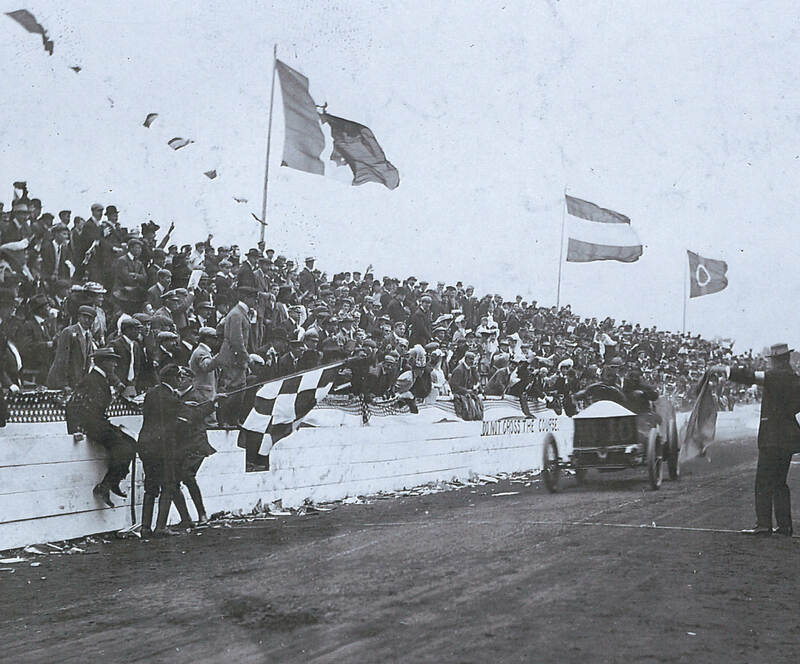 1905 Vanderbilt Cup Race: Wagner (far left) with the Fiat driven by Felice Nazzaro 1906 Vanderbilt Cup Race: Wagner set racing history using a checkered flag for the first time to signify the winner. Here, Louis Wagner drove a Darracq to victory. 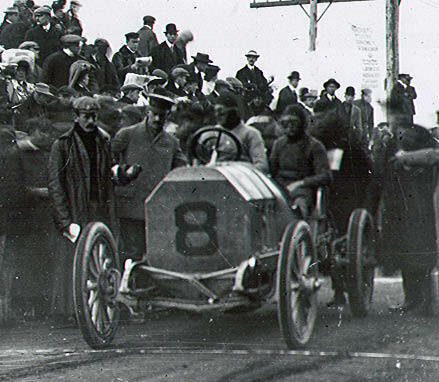 1908 Vanderbilt Cup Race: Wagner with the first American car to win the race- "Old 16" Locomobile driven by George Robertson. 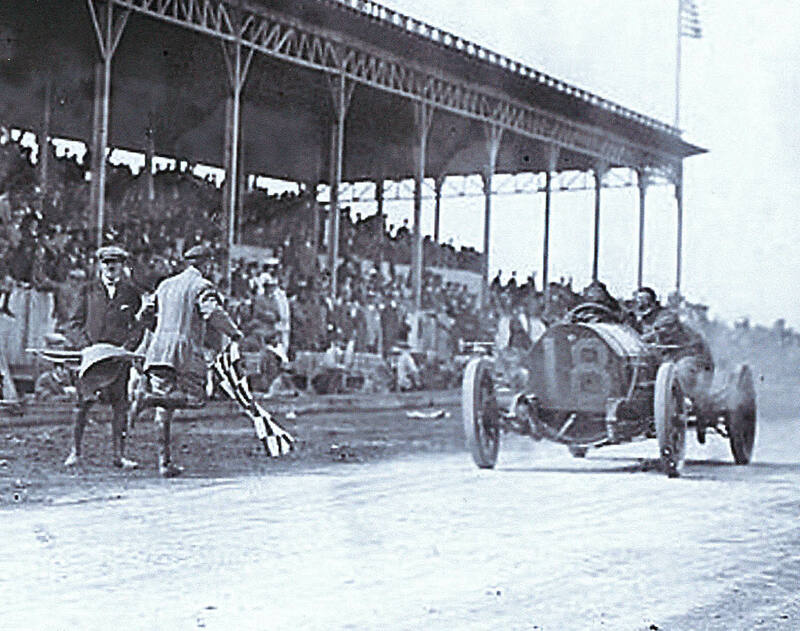 1909 Vanderbilt Cup Race: One of my very favorite photos, Wagner gave the checkered flag to Harry Grant in the Alco Black Beast. 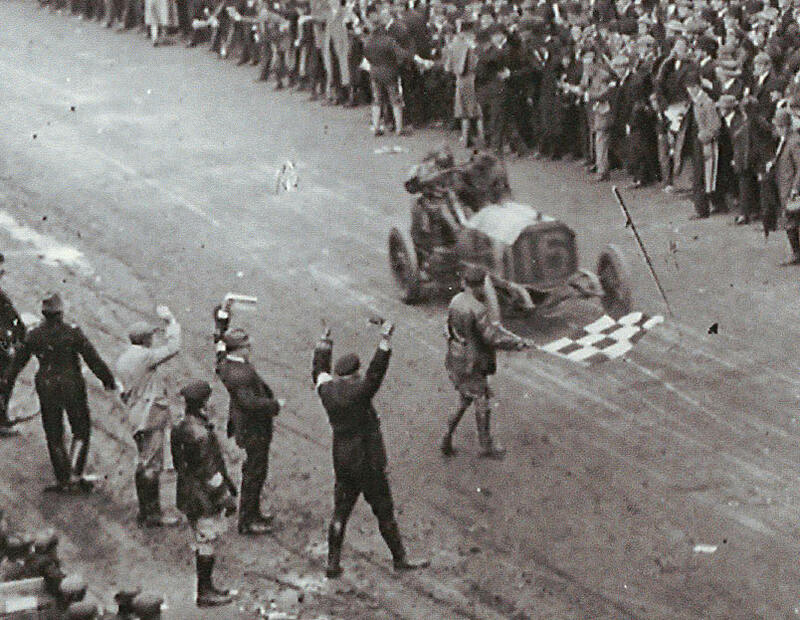 1910 Vanderbilt Cup Race: The Alco Black Beast again received the checkered flag from Wagner. 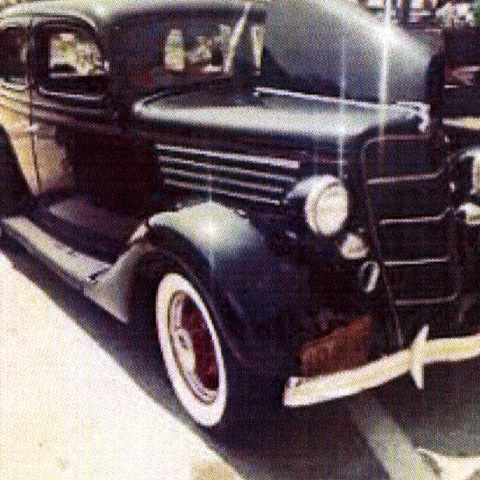 In 1938, Fred Wagner wrote an autobiography "The Saga of the Roaring Road". Mark reviewed the book on his excellent website firstsuperspeedway.com: "The AAA's premier starter from 1903 into the 1920's, Fred J. Wagner was the dean of his profession. 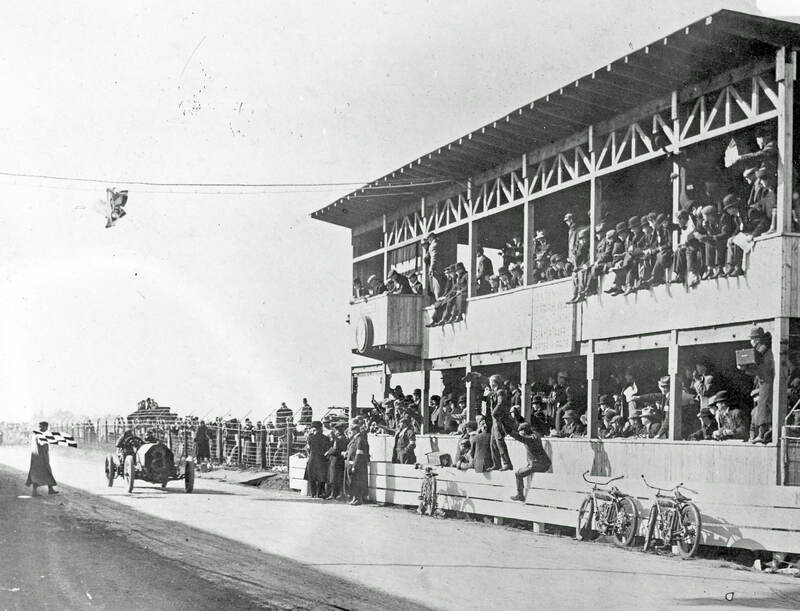 He started all the William K. Vanderbilt Jr. Cup races except 1904. He also started all the American Grand Prize races, the first two Indy 500s, as well as the early Ormond-Daytona Beach races and time trials. This book is less a history than a memoir; Fred's recollections of his first-hand accounts of the great events and the great drivers of the day: Ralph De Palma, Barney Oldfield, David Bruce-Brown, Bob Burman, Harry Grant, George Robertson. Like all of us, with the passage of time, the details can get a little fuzzy, so this is not a book to single source for facts. 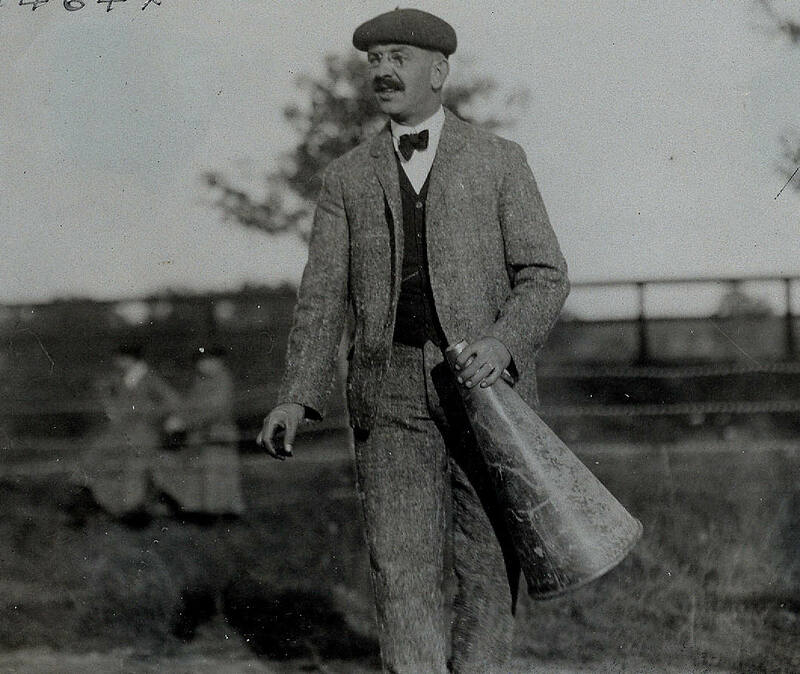 For example, Fred's recollections of David Bruce-Brown promulgated some myths about the great driver, such as his attendance at Yale University (he did not) his time as a boxer (he was not) and even his date of birth, popularized as 1890 when it was 1887. The book is valuable because it captures the spirit of the early days. Fred was a man with many friends and brings insights to the personalities of the early days. With the understanding that point of view of the book comes through the lens of a proud man who took himself very seriously (I think that will be readily apparent to anyone reading just the first few paragraphs) and it will be one of your best experiences in understanding what it was like to walk among the wonderful characters of his era."